This pedal-assist bike, featuring SRAM’s E-Matic System, seems like a no-brainer for the urban bikes juggernaut. When we received the press release on the Townie Go! prior to our trip to Las Vegas, we wondered, “why didn’t Electra jump on this sooner?” A pedal-assist kit seems the perfect fit for the Townie. 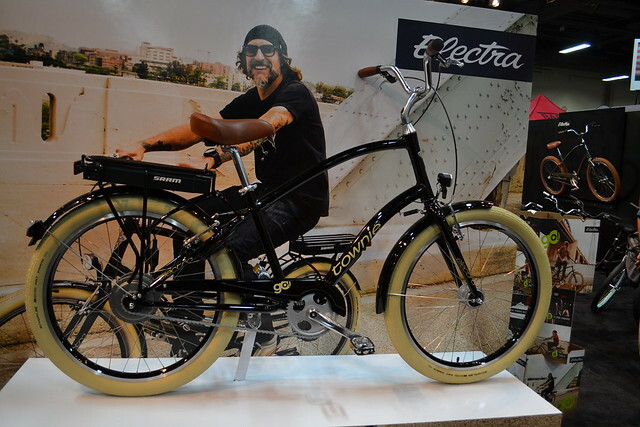 In any case, we’re glad to see Electra got into the e-bike market with this model. It’s available in men’s and women’s versions, with color-matched fenders, dynamo front hub, cargo rack, and a lot of other utility-friendly features. We didn’t get a chance to ride the Go! out in the Paddock…we simply ran out of time. Hopefully we’ll be able to get our hands on a tester to share with you at some point. I like the concept of an e-bike, but I have a difficult time spending the money on one. They’re still pretty expensive, and they’re not really going to replace a bike for me. I have a couple of nice commuter bikes and a road bike. The commuter bikes also see touring duty, and one of them also sees errand duty(you can carry a bunch of stuff in panniers and a front basket). The road bike eats miles but it’s also fun in town. The e-bikes I’ve seen would be ok to commute on and to run limited errands on, but none of them look like I’d want to ride them very far, and none of them seem useful for much but an urban commute. Then there’s the legal restrictions regarding top speed. Many states limit e-bikes to 20mph. I can do that on my own. What I can’t do is pedal at 35mph for an extended period.Lance Armstrong can, and if he did so on a public road he would be legal. Why should my top speed be limited simply because my VO2 max and EPO budget are limited? Mike, I’ve often wondered the same thing: why is there a speed limit on e-bikes? I think the industry has a way to go when it comes to range and speed of such bikes, but e-bike tech is maturing quickly.